Objective: To increase the production & productivity, proper utilization of agricultural implements, reduce the wastage of the produce, value addition and quality augmentation, reducing marketing margin, reduce the risk of production, development of allied sectors. The programme was organised at Nadia Krishi Vigyan Kendra, BCKV, Gayeshpur, Nadia. Nearly 200 progressive farmers from all corner of the district participated in the programme. Dr. Tapas Mondal, Hon'ble MP, Ranaghat loksabha constituency, Prof. Kaushik Brahmachari, Director, Directorate of Extension Education, BCKV, Dr. K. Gorai, Horticulturist, Nadia, Dr. Amrito Chattopadhay, DDM, NABARD, Nadia, Dr. K. K. Goswami, Sr. Scientist & Head, Nadia KVK were also present during the programme. Chief Guest's Remarks:Hon'ble MP appreciated the effort of Nadia KVK in organising this type of programme within a short a notice. He emphasized on increasing production and productivity of crops since population is growing rapidly. For doing this he advised to give the importance on quality seed, incorporation of fertilizer based on soil health. He also cautioned to protect produces from wastage. value addition was another area where Hon'ble MP emphasized on. Improvement of marketing facility and minimization of risk on the part of the farmers were also given due wieghtage. 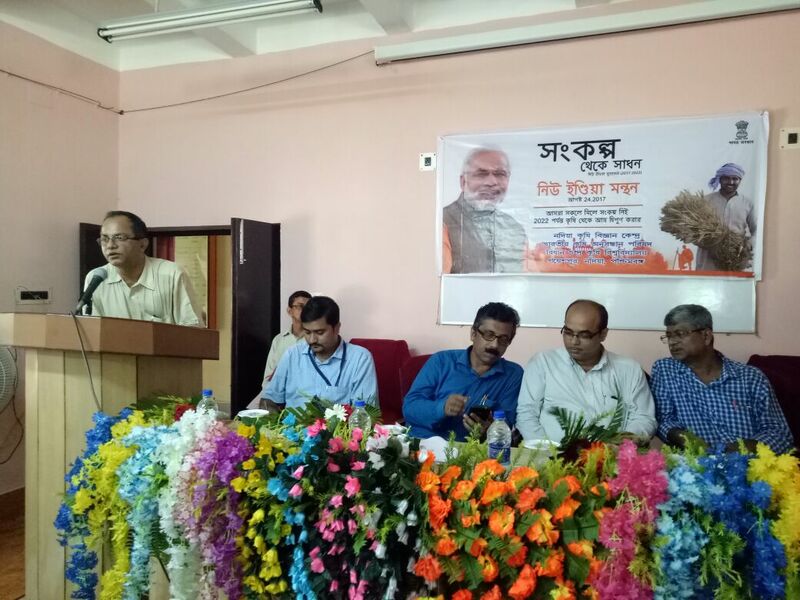 Post Event Details:The programme was organised at Nadia Krishi Vigyan Kendra, BCKV, Gayeshpur, Nadia. Nearly 200 progressive farmers from all corner of the district participated in the programme. Dr. Tapas Mondal, Hon'ble MP, Ranaghat loksabha constituency, Prof. Kaushik Brahmachari, Director, Directorate of Extension Education, BCKV, Dr. K. Gorai, Horticulturist, Nadia, Dr. Amrito Chattopadhay, DDM, NABARD, Nadia, Dr. K. K. Goswami, Sr. Scientist & Head, Nadia KVK were also present during the programme. 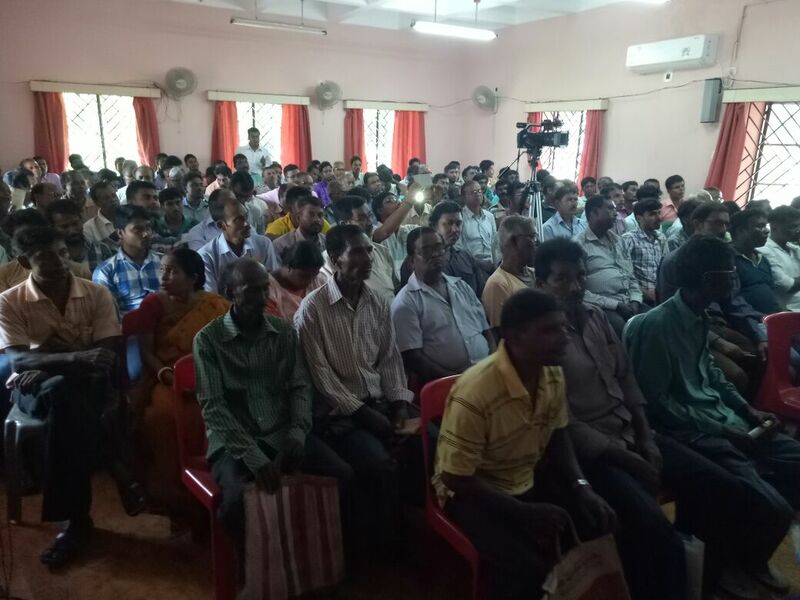 After the event discussion was made with the line departments like Department of agriculture, Department of horticulture, Department of animal resources regarding the course of action to taken up considering seven main points for doubling the income of the farming community within five years i.e. 2022. During the event, 7 major points were discussed by the chief guest and experts from the discipline of agriculture and horticulture before 200 farmers. Image: Farmers present in the programme.